BALANCE YOUR ENVIRONMENT. BALANCE YOUR LIFE. Welcome to That Feng Shui Lady’s website. If you’ve found yourself here, my guess is that you’re either looking to add more peace and balance to your life, or that there’s something that keeps you awake at night that you don’t know how to “fix”. (The latter being what got yours truly started) Whichever the case, you’re in the right spot. Whether you’re seeking health, money, love, a new job...anything! If you want it, you can manifest it right from your home! Come on in and find out how. To start, let’s answer the overall question. What exactly is Feng Shui? Translated from Chinese Feng Shui, (pronounced fung - shway), means "wind and water". Thousands of years ago, the Chinese realized that the energy (or "ch'i") of the earth’s environment is also embodied in the energy of our homes. Based directly on the flow of the elements in nature, the principles of feng shui mimic the growth and regenerative cycles of the earth. So if we can grasp that outside our doors, water is feeding wood, which is fueling fire, which is creating earth, which is producing metal which is melting back into water then we just need to grasp that the same thing is happening once we walk ­inside our doors. But since our homes don’t actually have space for full-on eco-systems, we need to add those elements on our own to encourage their flow. Feng shui teaches you what elements go where and how they can be represented in your home to help fulfill your aspirations. It can seriously be as easy as switching the color of your kitchen towels or getting a new doormat. 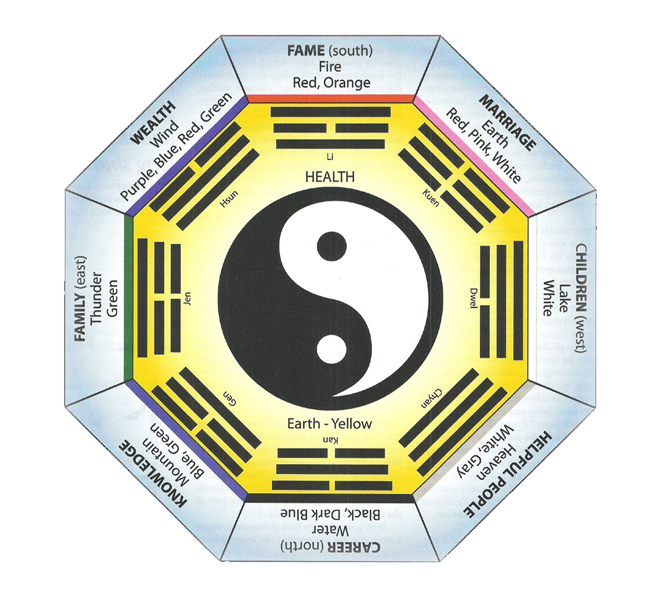 The bagua (bah-gwah) is the feng shui floor plan , and the guide to the flow of your home. Composed of 8 separate tri-grams, or “guas”, with yin and yang in the center, the bagua covers any situation that can come up in life. Career, education, family, wealth, fame, love, creativity, travel, helpful people and health are all represented. The job of feng shui is to guide energy to those areas to set you up for success. This is accomplished through arrangement of furniture and personal items, along with “elemental clues” you provide. When the proper elements are in place, energy works for you; but when the wrong ones make their way into those areas, bad luck, illness, loneliness, depression or just a challenging life can result. The good news however, is that everything can be fixed. So even if your home is full of “misplaced elements”, it takes very little to adjust. Through proper placement of furniture and accessories, your life can be as successful and fulfilling as you want it to be. It really is that easy. Call or email Valerie today for a consultation. After discussing with you what you’d like to manifest from your consultation, Valerie will conduct a space by space assessment of your home*. She will educate you, in simple terms, on the bagua, the elements, and how they align in your environment. You’ll learn what changes can be made to enhance your home’s energy and will tbe able to record the information in a workbook, specifically tailored to your home. Consultations generally last about three and a half to four hours. You will receive a follow up visit (about 45 minutes) within one year of your consultation to check progress and make additional adjustments. Plus phone, text and email access to Valerie with questions or concerns for one full year after your visit. Valerie will conduct a room by room review of your home office via video-chat. The two of you will discuss your current situation and she will advise you on the specific areas in your home to address to accomplish your goals. You will be educated on the bagua and how it fits in your home, along with the elements and how they can be represented to best benefit you. suggestions will be made for changes that can increase the energetic flow and balance of your home. You will receive a digital copy of your bagua to refer to during the call and work pages on your focus areas. Independent studies have shown that staged homes sell 78% faster than non-staged homes. Through implementation of clutter and space clearing, eye pleasing furniture design and appropriate element placement, she can help you prepare your home for a faster sale. If you are in the market for a new home or office, Valerie will view floor-plans and attend site inspections to help choose the most auspicious property for you. Just as you impact the energy of your home, so does anyone else who lives there, or anyone who has previously lived there. Though we generally know little to nothing about them, previous homeowners leave behind traces of their daily activities and dispositions. Cleansings help to clear out old, stale energy that can get in the way of your happiness or health. *All services are available for home, office and landscape. I was totally unaware that the boxes and clutter piling up in the corner were having such a profound effect on my life. That Feng Shui Lady helped identify and clear cluttered areas and explain the correlation to the blockages I was having in my physical and emotional life! Needless to say I was astounded and pleased when, after clearing the spaces, I found a new, palpable and very powerful flow of energy in my home. With that change, made some significant and productive adjustments to my life.... thanks Feng Shui Lady! That Feng Shui Lady provided a very professional, non intrusive service and made the whole experience very enjoyable. She explained everything in an easy to understand manner and in a way that “made sense” to me and my family’s needs. Even my husband who was skeptical about the whole experience, seems to have a new lease on life. Valerie's guidance in helping him to create form, function, flow, and fun to his home office environment has greatly contributed to his peace of mind and the success of his business. As an interior designer, I valued her suggestions on decor and color; she also suggested some things that I never would have thought of. Since the consultation, I had a surprising windfall and a new job opportunity - I attribute both to Feng Shui! I would recommend this service to anyone wanting to freshen up their environment in an easy and practical way. I am grateful to Valerie for sharing her wisdom and promoting peace, harmony, and prosperity into my life! Valerie explained the layout of my home through the bagua and taught me about the elements and how they can either work for or against you, depending on where they were in your home. She chose colors that I personally would never have looked at, but the end result is a warm yet bright environment that I love. Everyone who comes into my house says how beautiful it is and loves the color combinations she chose. She also Feng Shui’d my landscaping and the results from that are both beautiful and amazing. I not only love being in my house, I love being outside it too! Since I have applied all of the principles (and also some cures she helped me with), I have been making more money, I feel healthier and more at ease and my relationship is better than ever. I recommend That Feng Shui Lady to anyone who would like to make their life better. She has made a huge difference in my life and I can’t thank her enough. I attribute my success in life to learning how to control my life. That I learned from That Feng Shui Lady, Valerie Sands. I moved into a new apartment on the beach, but I didn’t feel quite at home until Valerie came in and worked her magic. She rearranged my apartment according to Feng Shui and the elements…then things really started happening for me. I became more successful and recognized at my job; I started paying more attention to myself and my health. Since Valerie Feng Shui'd my home, I have lost 10 pounds and ran in the first two marathons in my life!! Most importantly, I began to open up to others…something I always had a hard time doing. Our home has a new pleasantness. My office is suddenly more productive and my personal energy is noticeably increased. It is completely attributable to Valerie, that Feng Shui lady's advice. We went through the motions and made the changes. Even before we completed all the ideas that Valerie presented, the positive change was noticeable." A 19-year veteran of the corporate world, Valerie Sands began her independent study of Feng Shui in 2005. Astounded at the transformations she experienced, over the ensuing years she continued to delve deeper into her independent study. While helping friends and family apply the practice to their lives, she witnessed their dreams and visions begin to come to fruition as well. After 5 years, she decided to study for her Feng Shui certification and begin a new career; working for herself and for the betterment of others. Studying under Michelle Luongo of the East Coast Academy of Feng Shui, Valerie received her certification in 2010. Valerie is a graduate of Florida International University with a Bachelors in Spanish. 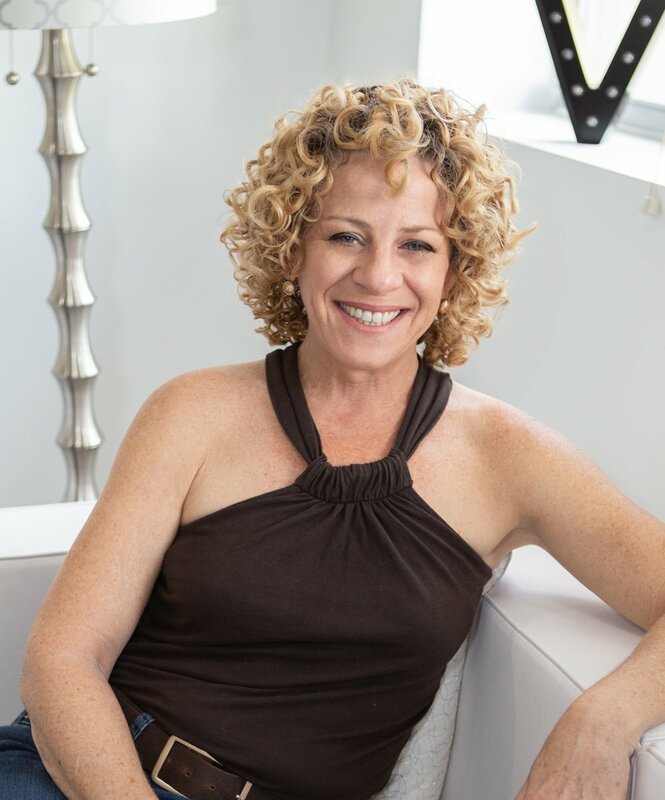 She is a member of the Real Estate Staging Association and has presented to the REALTOR Association of Greater Fort Lauderdale, the Miami Association of REALTORS and the National Kitchen and Bath Association. Testimonial from a REALTOR workshop focused on attracting the foreign buyer. I really enjoyed your class today and got some great inspiration. My focus is on attracting buyers from Toronto. Tonight unexpectedly my two friends in Toronto that know of my new real estate career and interest in Toronto customers sent me a gift of a round trip airline ticket to come up for a Diwali (Indian holiday) weekend in October and introduce me to their contacts in real estate up there that I could build a referral connection with. How is that for serendipity?